The most ubiquitous statues are Virgin Marys, although Jesus, St. Francis, St. Joseph and St. Anthony are also popular. Catholic iconographic conventions underscore the qualities and virtues associated with the chosen saint; for example, Virgin Mary statues are often painted blue, and lilies and other blue and purple flowers may be planted around the statue. Occasionally a statue of Mary stands on a serpent with an apple in its mouth, which, I learned from a google search, represents Mary’s virginal status as “the new Eve.” St. Joseph and St. Anthony of Padua statues often carry a Baby Jesus; St. James the elder carries a pilgrim's staff. Statues can be made of a variety of materials, from cast concrete, resins, composites, and infrequently, much more costly marble. Even the most inexpensive statues (which can be purchased at lawn and garden shops as well as online at specialty sites) can cost over $100, while the larger, more elaborate ones cost hundreds of dollars and up. For working class homeowners, purchasing and installing a shrine represent a financial as well as a religious commitment. 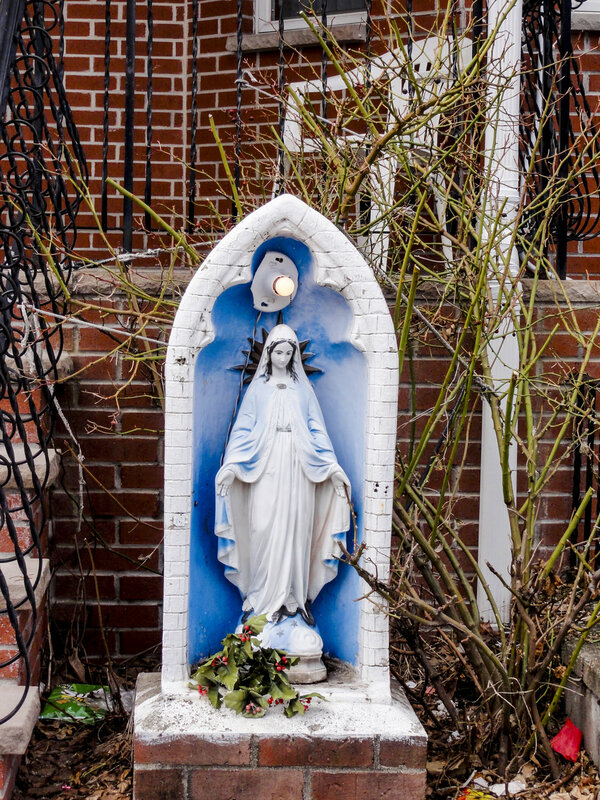 Yet, if a statue of the Virgin or a saint is intended to be the centerpiece of a front yard shrine, it remains, nonetheless, a mass made object purchased "as is" by the homeowner. Where the homeowners' creative juices really come into play is in the positioning, construction and decoration of the housing they wish to provide for their statue. The variety of housing styles is impressive indeed. Here goes! The classic bathtub: The classic treatment for statues in Somerville's front yard shrines is in a recycled bathtub; hence the nickname “Bathtub Marys”. These are set vertically into the ground deeply enough that the enclosure approximates the tall narrow half-dome shape of architectural niches found in Catholic cathedrals and chapels. Bathubs come in a variety of shapes and sizes, and their interiors are often painted, usually in blue, although some are green or left in their natural white or cream color. Another popular style of store-bought housing is the arched grotto, some of which feature columns. Owners express their individual creativity in decorative details such as paint, lights, and plantings. If an old clawfoot bathtub is not available, a more contemporary tub can be put into service.